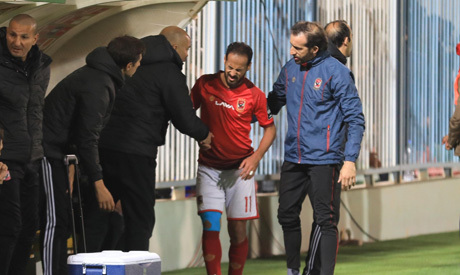 Ahly's star playmaker Walid Soliman is set to undergo medicals scans on the knee injury that he picked in Friday's Champions League draw with Algerian side JS Saoura, the team’s doctor revealed on Saturday. "Walid will undergo a scan today in Algeria to determine the extent of his injury," Ahly's doctor Khaled Mahmoud was quoted as saying by the club's official website. Soliman, 34, left the pitch late in the 1-1 away draw against the Algerian team in the second round of the prestigious African tournament’s group stage. Ahly's football director Sayed Abdel-Hafiz said after the match that Soliman had stretched his interior knee ligament. Soliman's injury creates more woe for the Reds, who are already missing key players like Marwan Mohsen, Ealid Azaro and Ahmed Fathi due to injury.